ES 1991 ?Ptas ISBN-10: ? 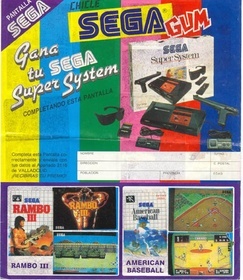 Chicle Sega (Sega Gum) is the name of a Spanish sticker book, released in 1991, as part of a promotional campaign of the "Chicle Sega" branded bubble gums, composed by 42 stickers with covers and screenshots of 14 Sega Master System games. The book had two parts, one in blue called "Pantalla Sega" (Sega Screen) composed by the cover and the first page, featuring 3 stickers with the cover, title screenshot and in-game screenshot, for each of the 8 Master System games in it (a total of 24 stickers), which once completed could be exchanged for a Sega Master System Super System console bundle and one in green called "Pantalla Acclaim" ("Acclaim Screen") composed by the second page, featuring 3 stickers also with the cover, title screenshot and in-game screenshot for each of the remaining 6 Sega Master System games (a total of 18 stickers) which once completed could be exchanged for a Wrestle Mania Challenge or a Knight Rider handheld LCD electronic game from Acclaim. To claim the prizes it was necessary to mail the sticker book to the address featured in it. The promotion ended on March 30, 1991.